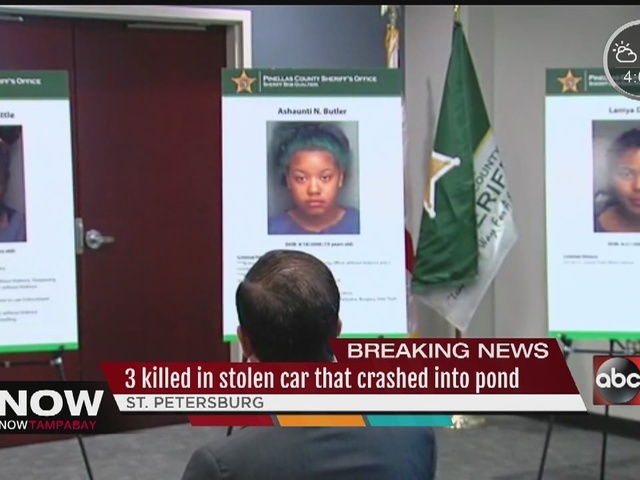 Three teenaged girls are dead after crashing a stolen car into a pond in St. Petersburg early Thursday morning. 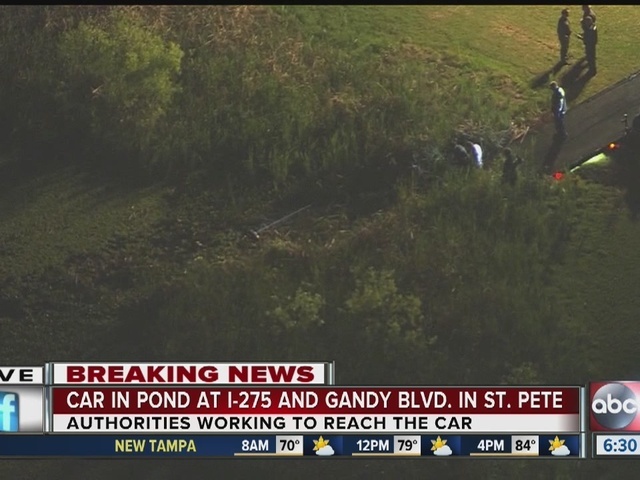 That pond is located on the property of The Royal Palm Cemetery located at 2600 Gandy Boulevard. 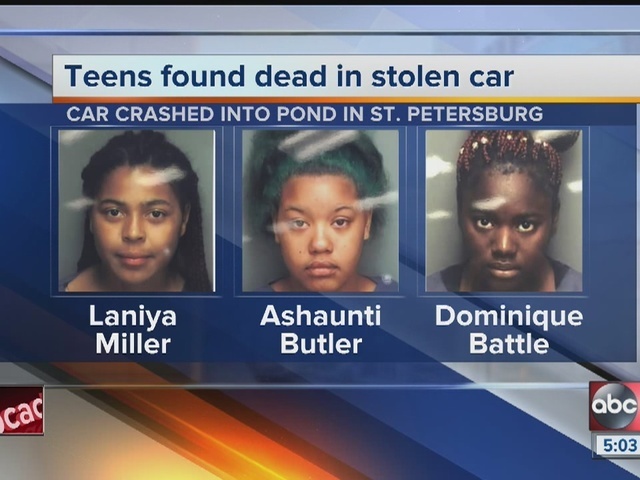 The teens are identified as 16-year-old Dominique Battle, 15-year-old Ashaunti Butler, and 15-year-old Laniya Miller. All three had criminal histories including grand theft auto. Combined they had seven grand theft auto charges against them in just the last year. In a press conference Thursday afternoon, Pinellas County Sheriff, Bob Gualtieri, laid out the timeline of events leading up to the crash. He said the girls were hanging out near the intersection of 22nd Ave South and 9th St in St. Pete and asked a friend to give them a ride to Child’s Park. That friend asked one of his friends, 35-year-old Damian Marriott to give the girls a ride; Marriott agreed. Investigators say as Marriott was on his way to take the girls to Child’s park when he decided to stop at a Walmart in south St. Pete to buy a TV. He left the girls in the car; with the car running. When Marriott returned the girls had taken the car. Around 3:30 a.m. Thursday, a deputy spotted the girls in the 1990 Honda Accord driving eastbound without headlights on Sunset Point Road near US 19. That deputy tried pulling the girls over but they wouldn’t stop and even ran several red lights. The deputy didn’t chase the teens because it did not meet the sheriff department’s criteria for a pursuit. Another deputy saw the car in the area of US 19 and Ulmerton Road. That’s when deputies confirmed the car was reported stolen out of St. Petersburg. The deputy in an unmarked car monitored the vehicle from a distance. entered the cemetery. When deputies arrived the sheriff says the driver of the car sped off through the cemetery to get away from deputies. We’re told it was so dark outside the teens likely couldn’t see they were driving into a pond. Investigators say the car made it nearly half way into the pond before it started to sink in water 15 ft. deep. Deputies tried to save the girls, and the Sheriff’s Dive Team was called but it was too late. The girls drowned. The dive team along with the help of a wrecker pulled the car from the water. Investigators say it was not clear who was driving the vehicle as the girls appeared to have been tossed around in the vehicle following the crash. The report said nobody in the car was wearing a seatbelt, but it's unclear if the teens took them off in an attempt to escape the sunken vehicle. The Sheriff described the number of occurrences of auto thefts by youth from the area of South St. Petersburg - as an epidemic. The Sheriff also said law enforcement would continue to do its part to suppress this type of criminal activity, to include the work of the Auto Theft Task Force, but stated other ways to combat the problem must be found. "Solutions need to come deep from within the community. Kids need to know there are consequences. This is a systematic and complex problem," said the Sheriff. "Three dead teenagers is not acceptable," he added.